I come from a very people-oriented shooting background, so still life is definitely out of my comfort zone. 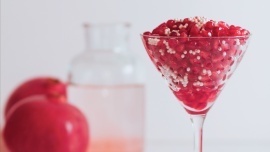 I'm used to talking to my subjects, so my boyfriend was giving me weird looks as I was talking to this martini glass of pomegranate while shooting these photographs. I was surprised at how much fun I actually had while doing this. I think the best part was eating all the pomegranate afterwards. I can see this food photography thing becoming quite dangerous for my figure... Maybe I should stick to healthy food for a while ;) Just kidding, bring on the cupcakes! !